FreeBSD empowers. Absolute FreeBSD empowers absolutely. The critically-acclaimed FreeBSD guide, now expanded, revised, and updated! FreeBSD is the muscle behind companies from Netflix to EMC. Any place where someone does heavy lifting on the Internet, you’ll find FreeBSD. Absolute FreeBSD brings FreeBSD’s strengths to bear on your problems. Managers ask “Why is it slow?” “How fast is it working?” “How many users can our current hardware handle?” Sysadmins ask “Can I set up a local software package repository?” “Where is that function, anyway?” “What do I do with this crash dump?” Absolute FreeBSD, from No Starch Press, answers these and more! Absolute BSD taught new sysadmins how to build and manage a FreeBSD server. Absolute FreeBSD dove deep into server management, taking you beyond just making things work and into understanding why they work. This third edition of Absolute FreeBSD updated all that knowledge and covers FreeBSD’s newest features. New readers will still get the solid introduction they need, but fans of the earlier editions will expand their skills still further. All in the inimitable style that has made Lucas’ system administration books so popular. 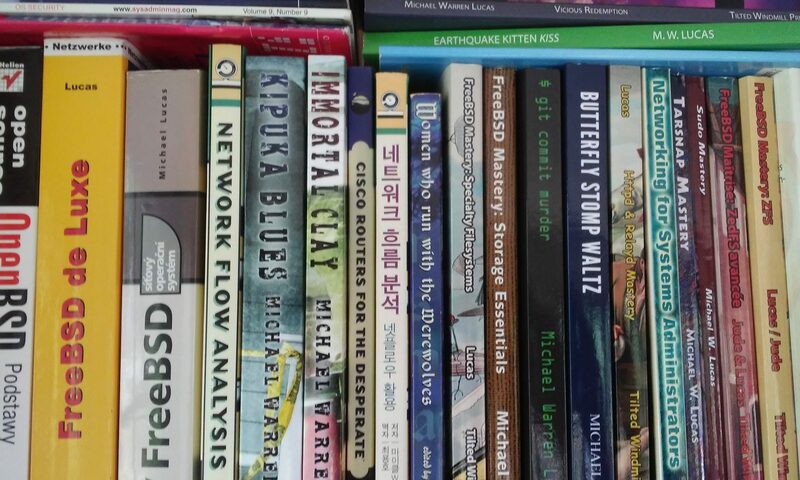 No Starch Press offers a print/ebook combo Use the coupon code ILUVMICHAEL to get 30% off on and put a few extra bucks in my pocket! ZFS improves everything about systems administration. Once you peek under the hood, though, ZFS’ bewildering array of knobs and tunables can overwhelm anyone. ZFS experts can make their servers zing—and now you can, too, with FreeBSD Mastery: Advanced ZFS. • dive deep into pools, metaslabs, and more! Whether you manage a single small server or international datacenters, simplify your storage with FreeBSD Mastery: Advanced ZFS. FreeBSD includes many special-purpose filesystems. FreeBSD Mastery: Specialty Filesystems takes you through these filesystems, helping you solve problems you didn’t know you have. These filesystems underlie everything from application servers to jails. Normally I don’t care if you buy the print or ebook version, but the cover art of this book wraps all the way around to the back cover. In my unbiased opinion, it’s fairly spectacular. Buy the print book from Amazon, get the Kindle version for $2.99 through Amazon’s MatchBook program. Data Storage for the 21st Century and Beyond! Print and ebook bundle? If you buy the print from Amazon, you can get the ebook for $2.99. Read FMSE Chapter 10: SMART right now. Gumroad – PDF, epub, mobi, DRM-free. OpenBSD is the world’s most secure networked operating system, in wide use by Internet Service Providers, corporations, and embedded systems manufacturers. The original Absolute OpenBSD was the go-to work on this operating system, earning praise for a decade after its release. The best-selling standard work on OpenBSD, fully revised and expanded! The first copy of Absolute OpenBSD off the press was auctioned off to support the OpenBSD Foundation. This new edition is fully rewritten and contains the latest details about key OpenBSD features such as the PF packet filter, network VLANs and trunks, packaged software, building your own releases, diskless installs, and more, more, more. Absolute OpenBSD goes into depth on the features that set OpenBSD apart from the crowd of free UNIX-like operating systems. It reaches beyond explaining what to type, and instead takes the reader into why things work that way.